DVD Synopsis: Haunted by horrifying childhood memories, the son (Vincent Price) of the Spanish Inquisition's most notorious assassin teeters on the brink of insanity. But when his adulterous wife fakes her own death to drive him over the edge, she soon discovers that betrayal cuts both ways – as the man she wants to destroy becomes not only her judge and jury – but also her executioner! No actor was better suited for Edgar Allen Poe than Vincent Price. He embodied both the gentle sophistication and deep-seated despair that a Poe character demanded, and when it came to depicting a slow descent into madness, Price had no equal. 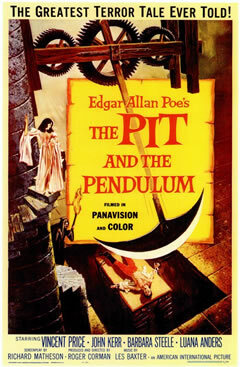 Director Roger Corman brought great style to his various Poe adaptations, constructing an ambiance of foreboding doom by way of elegant period costumes and baleful set pieces. Showing a flair for color and an understanding of what it is that makes people squirm, Corman breathed new life into the great writer’s chilling compositions, with Vincent Price mixing in just the right amount of the macabre for good measure.